Enter the Barbie: Dreamtopia Sweetville Castle and bring the world of mermaids, princesses, and fairies to life! Inspired by the magic of Dreamtopia's Sweetville Kingdom, the castle is full of delicious surprises. 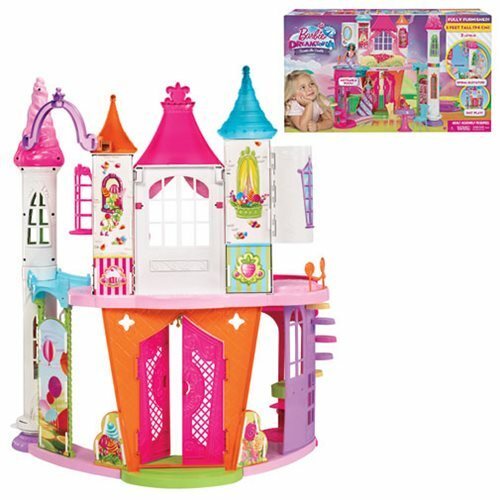 The large two-story playset has bright colors and signature details on all angles, like cutouts, windows, and turrets. Inside, eight distinct play spaces inspire all kinds of storytelling. Classic spaces like the entryway, dining room, bedroom, and bathroom have fairytale touches, and a chandelier hangs by the front door to welcome guests. The first-floor dining area has room for the table, two chairs, two table settings, a punch bowl, and food (all included! ), and a shelf on the wall holds a cake that looks good enough to eat! Travel between floors using the colorful spiraling steps or the elevator that easily swirls dolls up and down with child activation. The second-floor bedroom allows for sweet dreams, with a fabulous princess bed and blankets, curtains, closet with hangar, vanity, and storage nook. The bright translucent pool is removable to dive deeper into fun. Young imaginations can dream up new adventures, as there are so many rooms to explore and so many stories to tell! Collect all the Barbie: Dreamtopia Sweetville dolls and accessories to fill the house and satisfy your sweet tooth! The playset includes the castle, a removable tub/pool, a table, two chairs, a bed, and smaller accessories like a blanket, hanger, and table settings. Dolls and other accessories sold separately. Colors and decorations may vary.